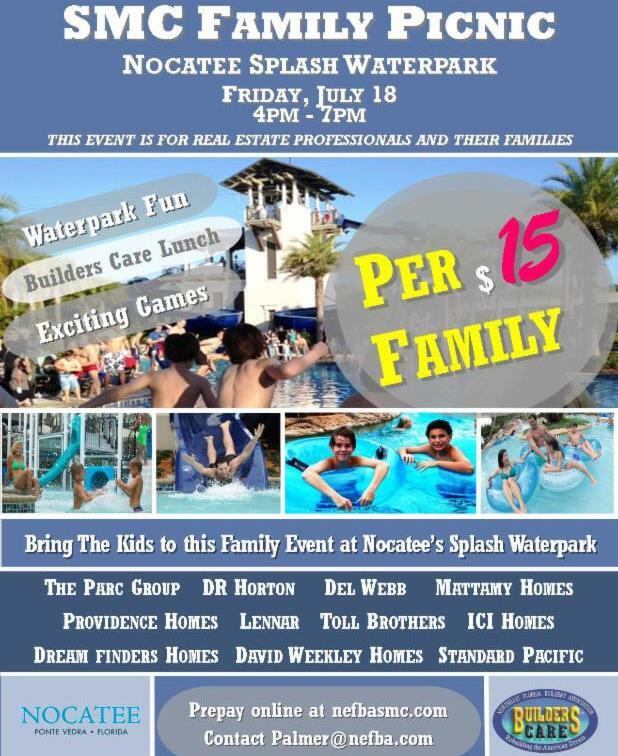 For the second year in a row, Nocatee will host the summer-time Sales & Marketing Council Family Picnic at Splash Water Park on July 18th! Real estate professionals and their families are invited to Splash Water Park for an evening of family-friendly fun from 4:00 to 7:00 p.m. Along with full access to Splash, the laid-back event is set to include games for kids of all ages. Nocatee homebuilders will have games set up at their respective builder tables, all situated on the Nocatee Event Lawn. After visiting and participating in fun games, realtors and their families will enjoy a catered 4 Rivers Smokehouse meal provided by Builders Care. Nocatee loves hosting NEFBA (Northeast Florida Builders Association) events to show its continued support and appreciation for the realtor community as Nocatee continues to grow. Splash Water Park is a place where the whole family can have fun, relax and enjoy the Nocatee lifestyle... the perfect location for NEFBA's SMC (Sales & Marketing Council) Family Picnic. Attendees will be able to relax in the Lazy Tides River, swim in the Lagoon Pool, twist and turn down Rip Tide Slides and splash around in Splash Cove. For those that wish to simply relax, you can soak up the sun in any one of the deck lounge chairs. Prefer relaxing in the shade, enjoy the poolside Cabana or take a seat under canopies throughout the park. Bring the kids and let NEFBA SMC and Nocatee say thank you with a day of fun for the whole family! Real estate professionals interested in learning more about the nation's fifth best-selling community should RSVP to Palmer@nefba.com. Tickets are only $15 per adult and kids are free! Visit nefbasmc.com to prepay online.